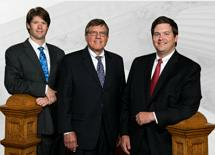 At Jenkins & Bowen, P.C., our attorneys possess sophisticated civil litigation and trial experience. We understand legal issues often involve technical, stylized data and documentation. We concentrate on civil trial work in both state and federal courts. We provide skilled and knowledgeable representation, particularly in the areas of serious personal injury, condemnation, zoning and land use, local municipal law and insurance law. Our specialized practice areas have resulted in an expertise relied upon by the State Bar and other reputable legal organizations in Bartow County and across the state. Our firm's philosophy is to provide the best possible legal strategies tailored to your needs. Our partners have exceptional reputations across Georgia. Many new clients come from former and present client referrals and other attorneys. We also represent many cities and counties across the state. Local Governments often seek us out to provide advice and legal opinions on revising and adopting ordinances. Our attorneys are often invited to present training sessions and seminars on complex insurance law, and zoning and land use issues. One of our partners also co-wrote Georgia Automobile Insurance Law, Including Tort Law, an annually published book used by the courts and cited by appellate courts for personal injury cases involving motor vehicle accidents. Our firm employs some of Georgia's hardest-working lawyers, all of whom possess extensive jury trial experience. We routinely use expert testimony and conduct accident reconstruction to build a persuasive case to present before a jury or judge. We understand how industry experts can provide a clearer picture of your case. Our firm was a leader in providing video evidence during condemnation trials to help juries see the effect of proposed power lines. We strive to keep current with advances in technology as they apply to litigation and trial. Our law firm proudly offers mediation services. Senior partner Frank E. Jenkins, III is certified with the Georgia Office of Dispute Resolution, and can help find alternative solutions to legal issues such as bad faith insurance, business litigation and land use. You can reach our legal team at 770-884-6856 or toll-free at 866-570-2287. If more convenient, you may also send us an email. For your convenience, we have office locations in Cartersville and Savannah.